Join us on a local affordable home build site, or in our Worcester or Ashland ReStore. This volunteer experience can be for fun or to fulfill hours. Join us on a local affordable home build site, or in our Worcester or Ashland ReStore. This volunteer experience can be for a group of friends, club, or recreational team. Your organization can sponsor an Operation Playhouse Build-a-Thon, or a local affordable home build day. These are wonderful team building events. For me, Habitat for Humanity is like my second family. After seven years I still feel the same enthusiasm as I did on my first day volunteering. The people at the ReStore are caring, friendly and helpful. There are many various tasks to choose from. There’s something for everyone. I found my niche in donations processing and pricing where I’ve had the opportunity to meet many wonderful donors. I never know what treasures or interesting items will come through the door on a given day. Every day is different and challenging. It’s so rewarding to volunteer beside family members who have been given a lifetime opportunity of owning a home. If you go to a home dedication, you will find it to be truly moving and heart-warming when these families receive the keys to their own home, especially since you know that you helped to make it happen. 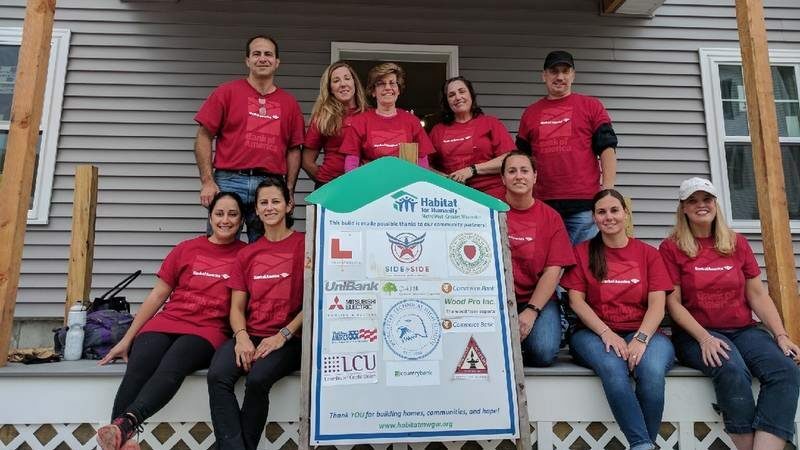 At Sanofi we’re committed to meeting critical needs in our communities, which is why we have partnered with Habitat for Humanity of MetroWest Greater Worcester for the past several years. 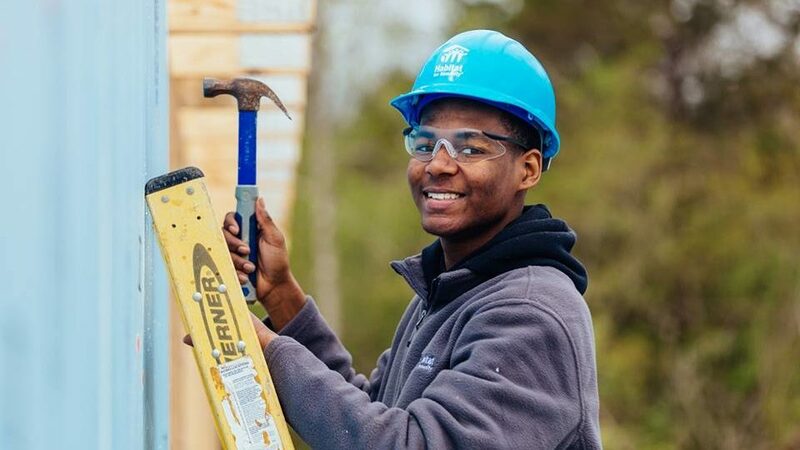 Not only has our partnership allowed us to support Habitat in providing affordable, safe housing for local families, but it has been a great opportunity for our employees – many of whom live and work in the MetroWest area – to get involved. This has been a favorite volunteer activity of our employees, who can see firsthand the important impact Habitat is making in our community. I've been building homes as a volunteer with Habitat for over six years following my retirement from a career that had nothing remotely to do with construction. I'm thoroughly enjoying this and it's actually become my retirement career. I've come to know a great group of other "regular" volunteers, most of whom have more expertise and better skills than myself, and are always supportive. From them and from the project managers I've learned a variety of skills that I've applied at home too. When there are groups volunteering from companies or organizations I've been able to help or guide their activities. That's particularly satisfying when I see someone trying and succeeding at something they've never done before. This experience has boosted my own confidence; I've even conquered my fear of heights. It's particularly gratifying meeting and working with the recipient of the house we're building. Every week I learn something new, use cool toys, get better exercise than any gym, and do all that while also getting the satisfaction of helping a family get a home. At Habitat for Humanity MetroWest/Greater Worcester, we believe that creating affordable housing is a community effort. We strive to create high-quality volunteer experiences for all members of the community seeking to respond to the need of affordable housing. 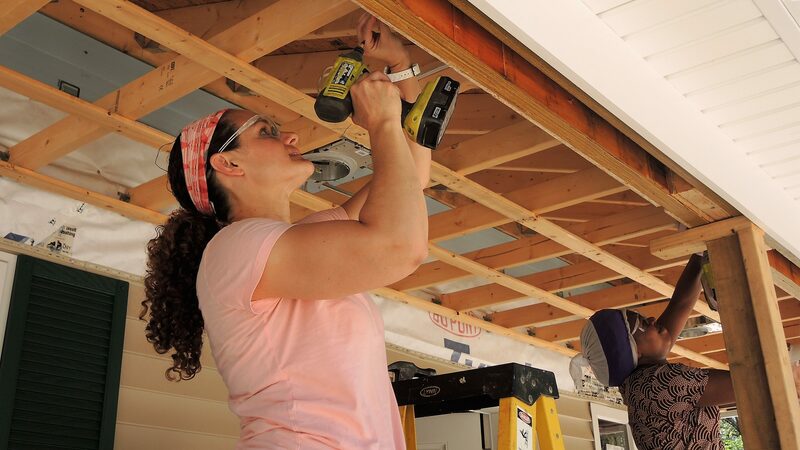 Volunteering is a great way to support Habitat’s mission, meet interesting people, and learn new skills! Join with us to create a world in which everyone has a decent place to live. Volunteer with us at our ReStore to sort fun donations, or on a build site to hammer some nails! Join a committee, or start a campus chapter! Habitat wants to provide a welcoming environment for all skills and talents. Want to learn more about volunteer opportunities with Habitat for Humanity MW/GW? These orientations are mandatory for those looking to volunteer at Habitat for Humanity MetroWest/Greater Worcester ReStore. Orientations cover the mission and vision of Habitat and ReStore as well as volunteer opportunities and expectations. You can RSVP for a session by signing up on CERVIS. Our Volunteer Management system, CERVIS, is embedded right into this website allowing for an easier and more convenient way for you to sign up for the shifts that fit your schedule. CERVIS will allow us to better communicate our volunteer needs and coordinate with volunteers, maximizing your time and abilities! If you had created a VolunteerHub account in the past 1 1/2 years your account information has been transferred. CERVIS will prompt you to verify account information and electronically sign a new waiver. How do I register my group for a volunteer opportunity? We love to have groups of volunteers at ReStore and out on our build sites! Please contact our Volunteer Coordinator to schedule your volunteer day, volunteer@habitatmwgw.org, 508-799-9259 ext 113. What do I need to do if I’m looking to fulfill court mandated community service hours? Habitat for Humanity MetroWest/Greater Worcester tries to accommodate requests for community service hours as much as possible. Please contact our Volunteer Coordinator Molly Pietrantonio either by e-mail at volunteer@habitatmwgw.org or by phone 508-799-9259 ext. 113 to discuss requirements and available opportunities. Letters verifying the hours will be completed by the appropriate Habitat for Humanity MetroWest/Greater Worcester staff member. We cannot accept court-ordered community service requests from person involved with drug, theft, or violent offenses. All volunteers must be 16 years of age or older. Those volunteers under the age of 18 will have to have a parent or legal guardian sign our safety waiver. Do I have to sign a safety waiver? Yes, when you create your CERVIS account you will be electronically signing a waiver. For those of you that created a VolunteerHub account in the past 1 1/2 years, CERVIS will prompt you to electronically sign our waiver. For volunteers under the age of 18 CERVIS will e-mail a waiver so a parent or legal guardian can sign off. All paper waivers must be completed and submitted before or on your first volunteer shift. Other then ReStore and being out on site, how else can I volunteer with Habitat? Join a committee, start a campus chapter, or volunteer on a Home Repair! To find out more about these opportunities contact Molly Pietrantonio, Volunteer Coordinator, volunteer@habitatmwgw.org or 508-799-9259 ext. 113. I am having trouble signing up on CERVIS, what do I do? Contact Molly Pietrantonio, Volunteer Coordinator, volunteer@habitatmwgw.org or 508-799-9259 ext 113. Do I need to have build experience to help out on site? No! Our build sites are no experience necessary. Our construction team and dedicated group of regular volunteers will instruct you throughout the day. What should I wear when I work on a build project? You MUST wear closed toed shoes. In addition, we ask that you wear safe comfortable clothes that you can work hard in. Our activities on site include every aspect of building, so expect to get dirty. Also respect that we live in New England and we build year-round. While we plan to be indoors during rain and snow, there is not always heat or air conditioning on our sites. We suggest wearing multiple layers and expecting a range of temperatures. Our site has plenty of gloves and safety gear, but you are always welcome to bring your own if you have it. Wear comfortable clothes that you don’t mind getting dirty and closed toe/heel shoes (athletic shoes or boots are best, no ballet slippers, crocs, heels, clogs, sandals, etc.). I’ll be at the ReStore all day, do you provide lunch? The ReStore does not provide lunch, but there are several lunch options close by. I’m supposed to start my ReStore shift at 9:30AM, but the store doesn’t open until 10AM. How do I get in? There is a doorbell on the left hand side of the main entrance door, press the button and someone will let you in. I would love to get my family more involved at the ReStore. Can I bring my kids along with me? The minimum age for volunteering at the ReStore is 14 with a parent or guardian present. Sorry, no exceptions. Ages 16 and over are always welcome. Can I bring a group along to the ReStore? Certainly! We have groups of up to 12 people volunteer at the ReStore. Contact the Volunteer Coordinator to set up a time to bring your group out. Please note: all volunteer groups must be scheduled in advance. What will I be doing during my time at the ReStore? It varies. As a general volunteer, your tasks may include: helping unload donations from vehicles, moving items to the store floor, assisting in pricing items, assisting in creating displays, greeting customers/answering questions, reorganizing/cleaning departments, helping customers to their vehicle with their new purchases, etc.